Oh, man. If you thought the last landmark was Dullsville, you may want to click here for something more interesting and get away from No. 50 as soon as possible. 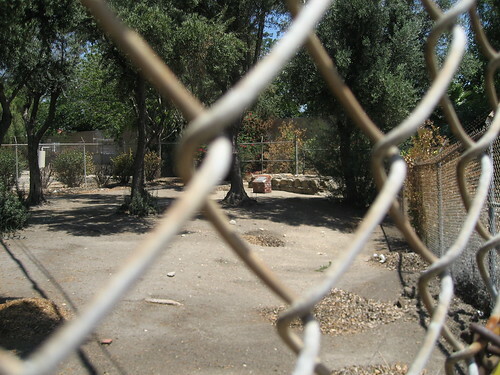 In the late 1700s, Padre Fermín Francisco de Lasuén and his brethren were trying to figure out where they wanted to build Mission San Fernando Rey de España (the San Fernando Mission). 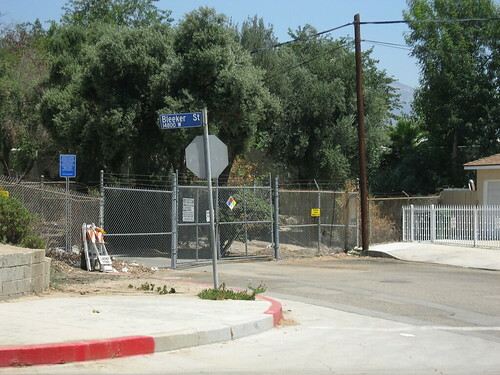 The discovery of natural swamplands in what is now this area in Sylmar is one of the things that helped push the decision to build the mission on the nearby conveniently named San Fernando Mission Boulevard. 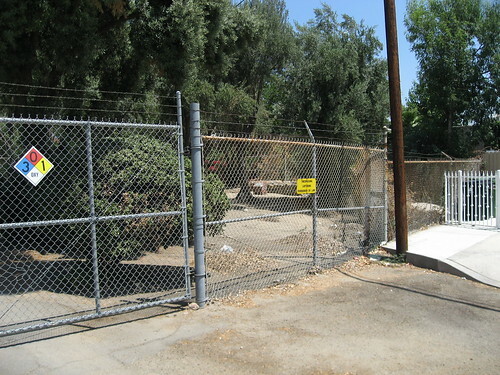 If you go there today, you’ll find the site is owned by the Los Angeles Department of Water and Power, which has the remaining landmarked well (there could be others, I guess) fenced off. 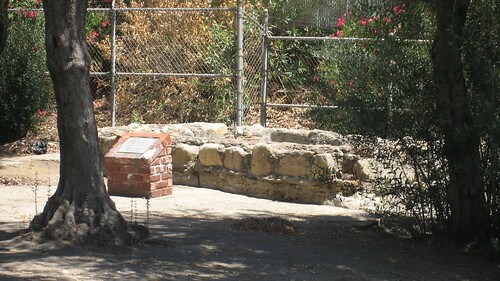 When I went, I asked a DWP worker if I could sneak in a few feet to get a shot of the plaque by the well visible through the chain-link fence. He asked his nearby supervisor who mustered a shake of the head, indicating ‘no’. And don’t ask me what area the ‘Settling Basin’ encompasses specifically, because I don’t know. I apologize for not getting any good pictures of this Historic-Cultural landmark. As a salve, I arranged what shots I did get in the order of closest to furthest. This way, you can pretend you’re slowly backing away from the site, just like I did in person. Oh. Here’s a legitimate shot of the same visible remaining well. It’s from the city’s Department of City Planning website. Nice neighborhood, by the way. 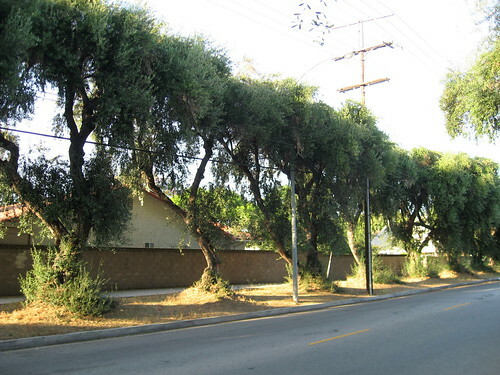 So what was up with all designations of tree-related Los Angeles landmarks back in the 1960s? 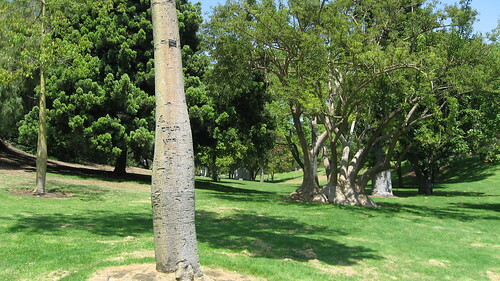 Including the Chavez Ravine Arboretum, a full six of the first forty-nine monuments declared are trees. I’m not sure what percentage that is, but fraction-wise it’s pretty close to 6/49. 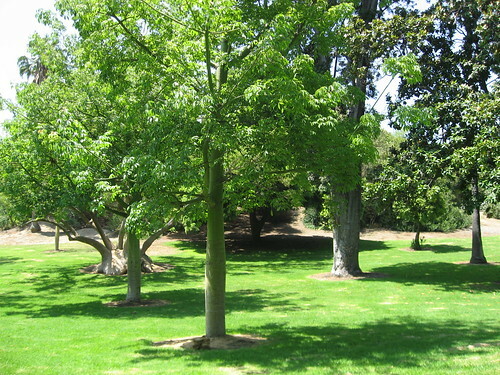 According to this website of the Chatsworth Chapter of the Daughters of the American Revolution, these trees were planted in 1893 by N.A. Grey, the Lassen Street property owner. 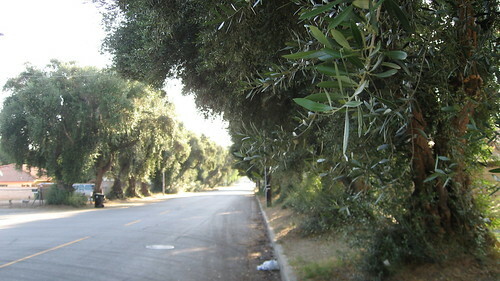 It also claims the trees were begun from the cuttings of olive trees at the San Fernando Mission. 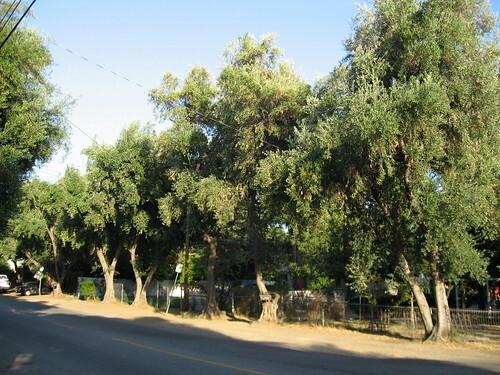 If you’re ever bored on a weekend and feel like driving to Chatsworth to check out these 76 Mature Olive Trees, don’t do so at my urging. 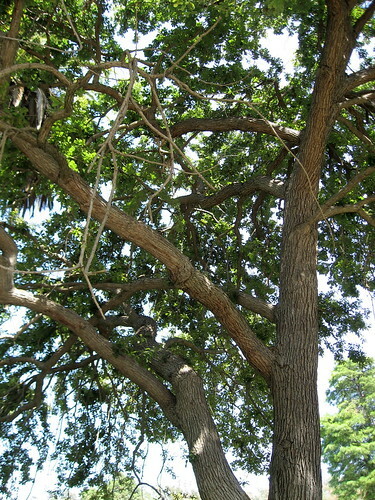 First of all, the DAR website says the trees are now down to 49 from the 76 of 1967. And the way they stand and are maintained, the effect of witnessing them in person isn’t all that remarkable. If it were up to me, I’d go to other Chatsworth sites instead. Okay, I’ll admit it. 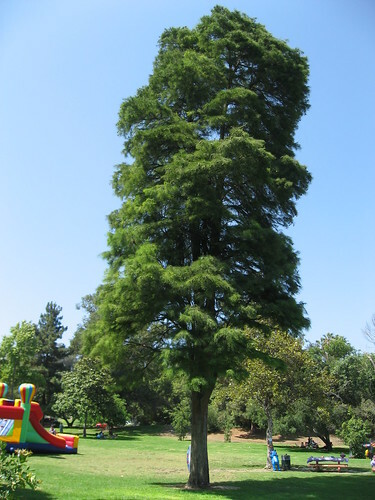 I couldn’t tell you the difference between a cupressus glabra or a cupaniopsis anacardioides if my life depended on it. If anything, this post will make that amply clear. 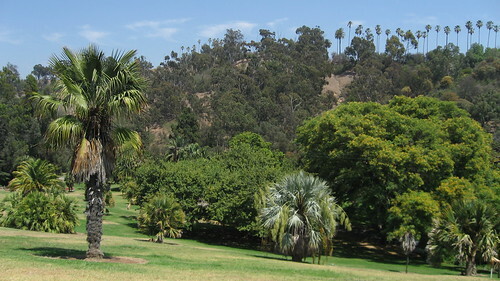 The Chavez Ravine Arboretum was started up by the Los Angeles Horticultural Society way back in 1893 and stands as the first and oldest arboretum in Southern California. 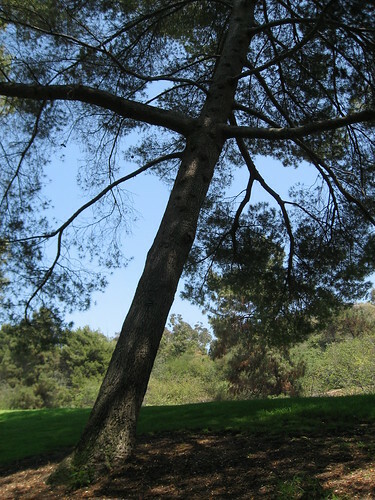 The fact that what amounts to a bunch of trees in the area around Dodger Stadium still being in existence is a bit of a minor miracle. 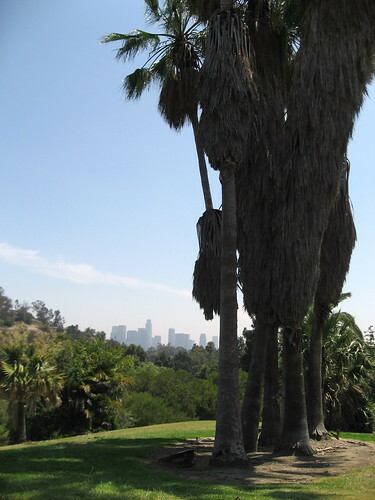 For me, spending a few hours in this Elysian Park enclave helped blur the usual heartwarming images conjured about by the mention of Chavez Ravine (named for landowner Julian Chavez, one of L.A.’s first County Supervisors). What a great space it is. I’m sort of surprised there weren’t more Angelinos taking advantage of the arboretum the Sunday afternoon I was there (although, admittedly, there was a Dodgers game going on around the corner, so maybe more forward-thinking folks than I avoided the park that day). 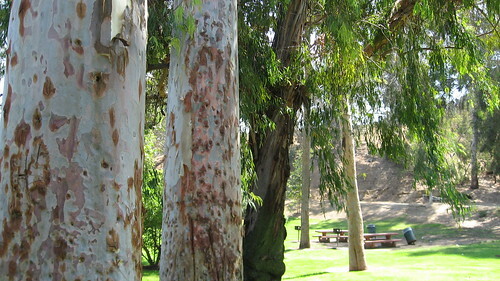 There’s a lumberyardful of rare trees – some 130 kinds – here, and trees are still planted annually. These pictures really don’t do justice to the arboretum (trees definitely fall into that category of subjects that seem cool when you’re there photographing them but, when you look at the shots later, fall kind of flat – I mean, they’re trees after all). 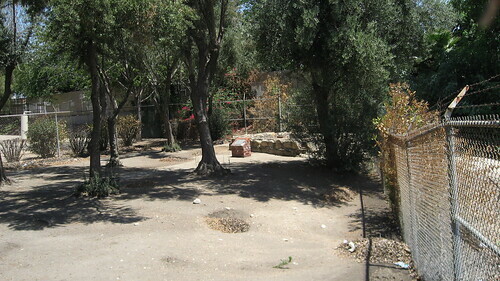 While no official tours of the site are given (a twice-a-year guided tour I bet would go over real well), the L.A. 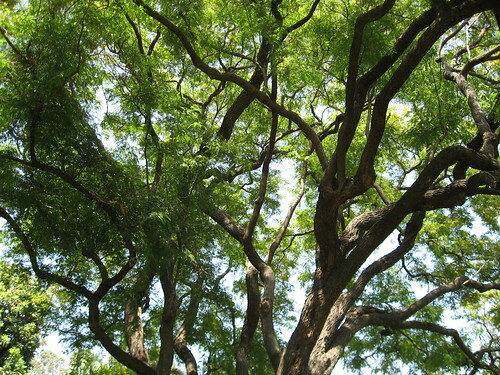 Parks website offers a map and reference list to 138 types of trees. However, what the map lacks in accuracy is made up with in illegibility – it’s really tough to read. (Go here for access to the map and list.) 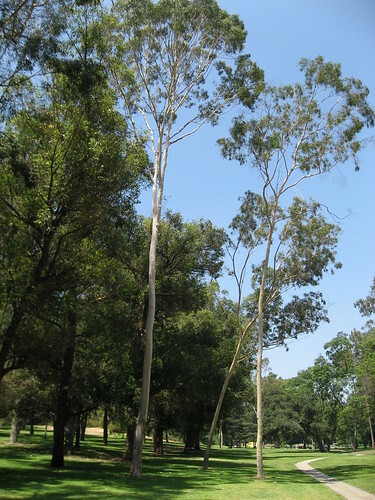 A few of the trees are invaluably (or is that valuably?) tagged, but many are not. 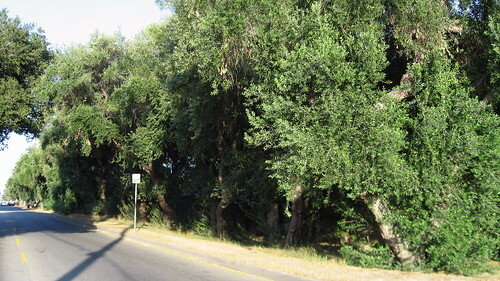 I figured I could sort out which tree was which once I got back to the BOL offices, but I was mistaken. 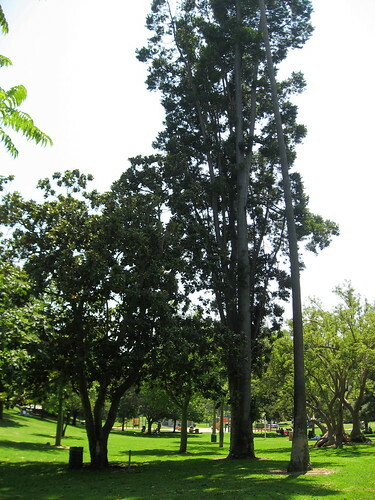 I even looked up pictures of various varieties on the web, trying to identify trees in photos that way, but it was just no good. 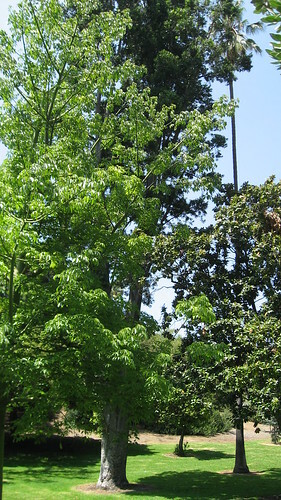 Anyway, if any of you more arboreally minded folks out there can identify something here or on the BOL Flickr page, you're welcome to let me know if I snapped a shot of a fraxinus uhdei or a rhapidophyllum hystrix. 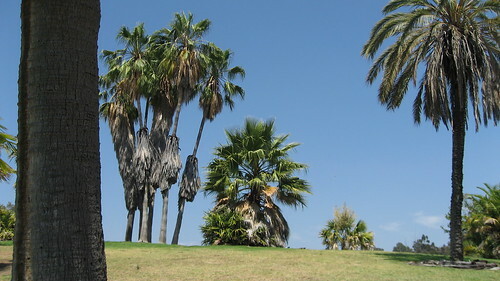 A cluster of Mexican Fan Palms (washingtonia robusta) with a cluster of downtown skyscrapers. 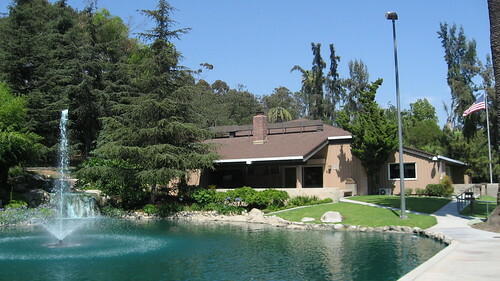 Above is the Grace E. Simon Lodge, named for the journalist/preservationist/community leader who spearheaded the movement to stop further development of Elysian Park in the 1960s and on. 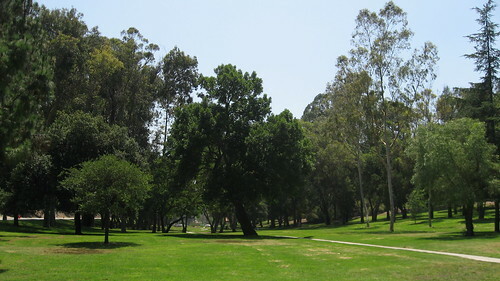 That fight sparked the formation of the Citizens Committee to Save Elysian Park. 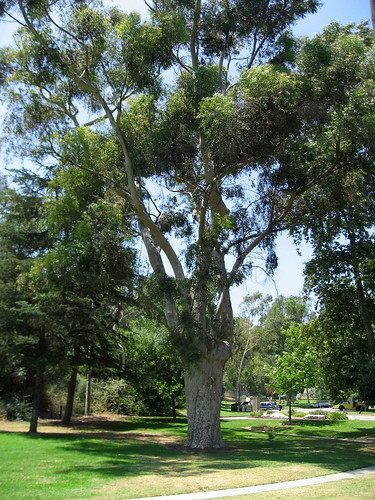 To read a comprehensive review of the Chavez Ravine Arboretum, click here to read a two-year-old L.A. Times article by Lili Singer. 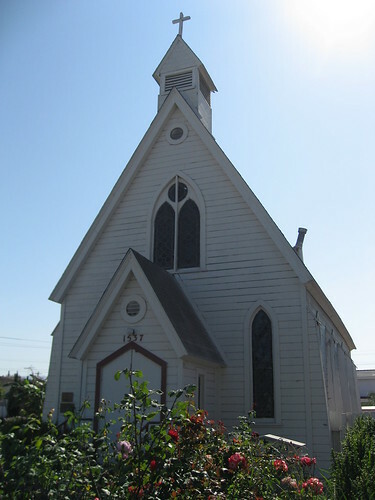 With the support of Mary Hollister Banning, second wife of Wilmington founder Phineas Banning, this frame church was built in 1883 for the Episcopal congregation established seven years earlier. 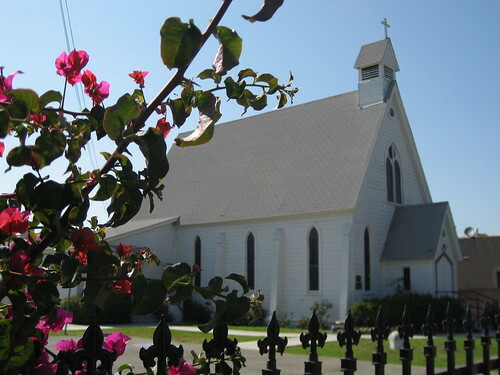 The church originally stood about a mile away at 422 North Avalon Boulevard and was moved to the present site in 1943. 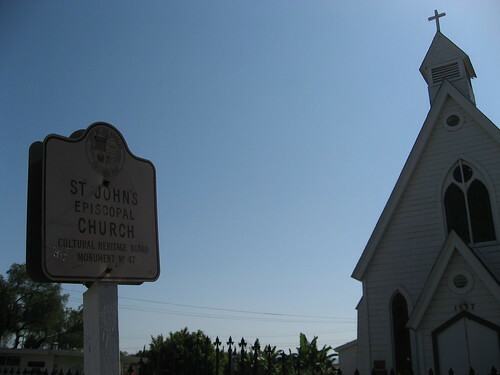 St John's maintains its record of being the oldest building being in continuous use for religious services in the harbor area. 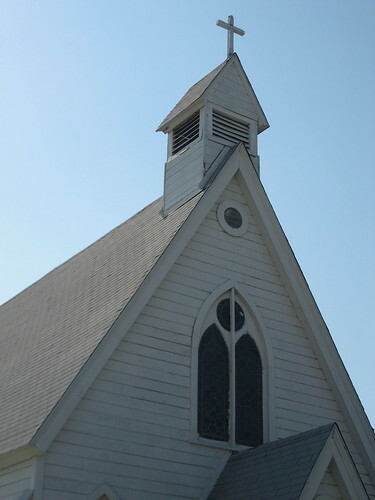 It's now home to the St John’s and Holy Child Episcopal Church, part of the Philippine Independent Catholic Church. The Reverend Greg G. Bayaca presides. The grounds were fenced off pretty tight the Sunday when the Big Orange Landmarks staff was there, so I’ve got shots of the east and south sides only. 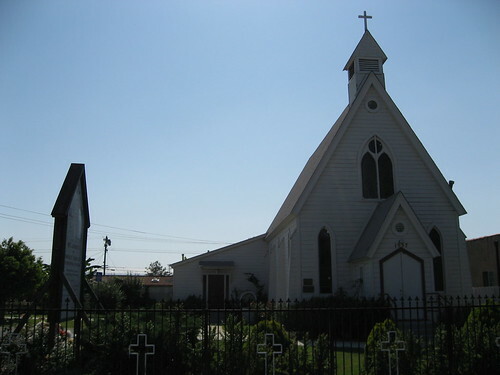 Don’t confuse this St John’s Episcopal Church with the one built some forty years later in Exposition Park. That building’s Historic-Cultural Landmark No. 516. 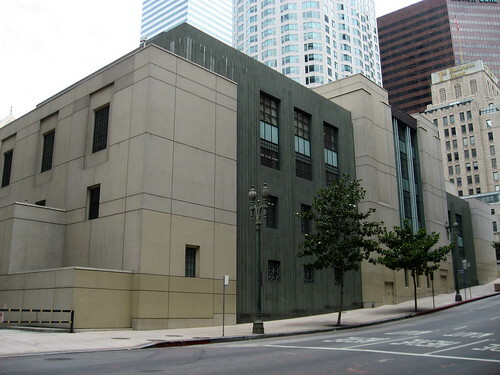 Los Angeles’s library was established in December of 1872 at Temple and Springs Streets. 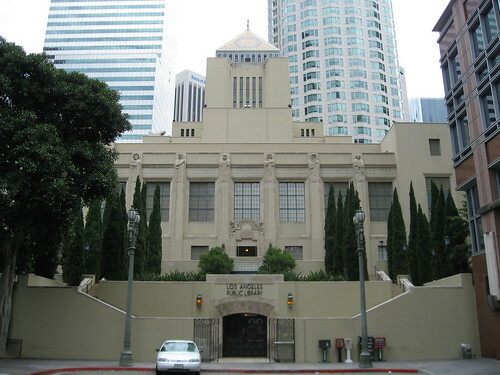 The state legislature passed an enabling act for a public library in the city in 1874, and the library was transferred to the care of the city in 1878. 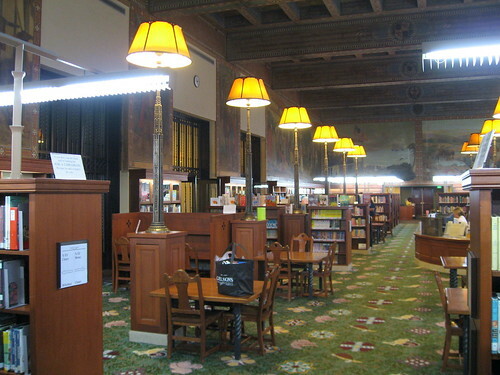 Harris Newmark, in his Sixty Years in Southern California 1853 - 1913, reports one of the first efforts to form a public library was made in 1859 with the undertaking not being all that well received. 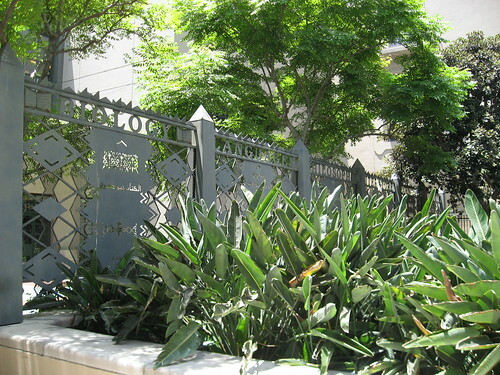 The Literate Fence, grillwork by Ries Niemi, fronting Fifth Street. 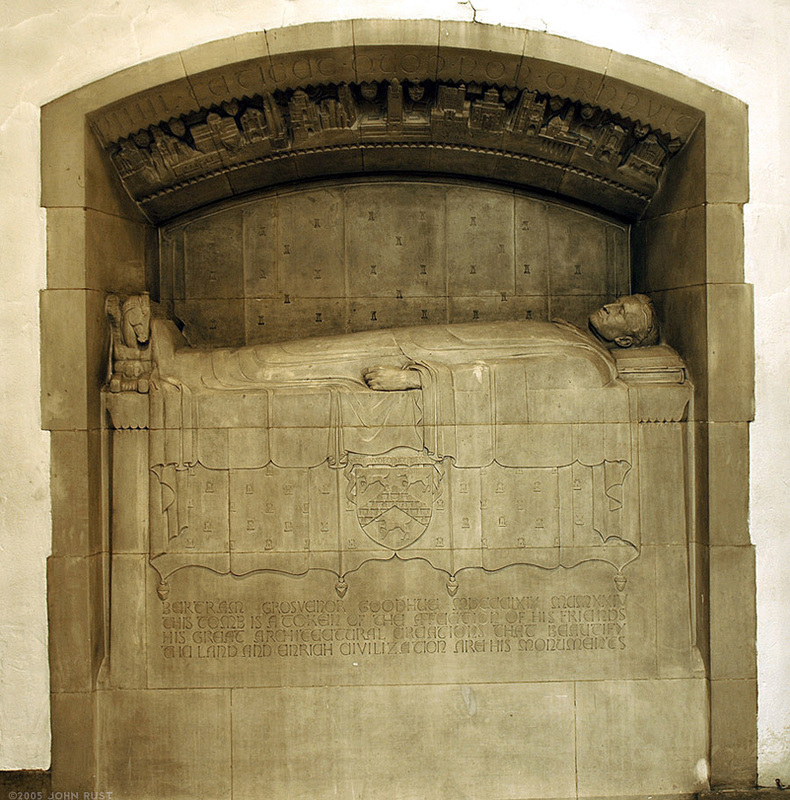 As an architect, Bertram Goodhue had been famous for the state capitol building in Lincoln, Nebraska, and Manhattan’s Church of the Intercession where he's buried. 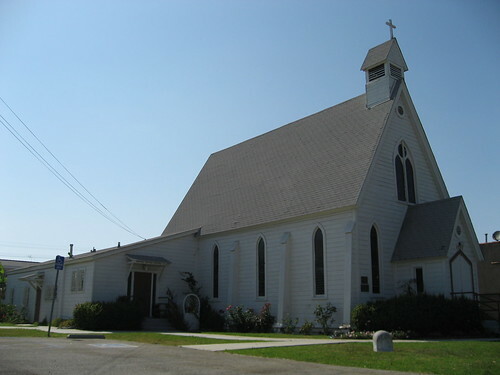 A long-time partner of Goodhue’s, Carleton Winslow was responsible for a bunch of buildings throughout Southern California, including the First Baptist Church of Pasadena. 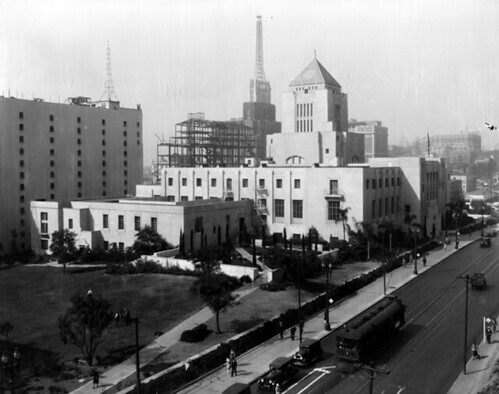 The library was built over a good chunk of the early 1920s, being dedicated on July 15, 1926. Goodhue, however, died in 1924, never seeing the finished product. 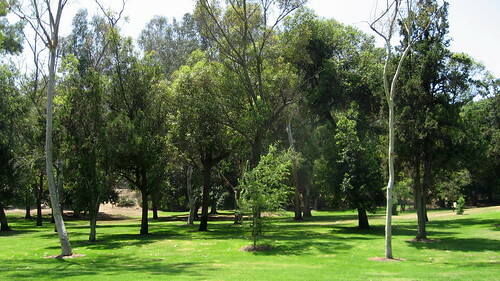 Compare all this newer section to the left with the broad lawn in the picture below. That's the California Club under construction in the background, right? 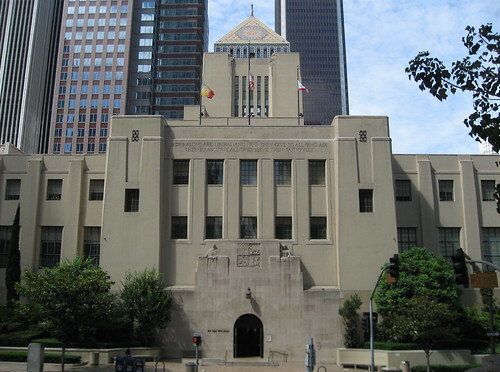 As early as the 1950s, the city began to consider that the Central Library Building had outstayed its welcome and should be removed. In the 1970s, it became more and more likely the library would be torn down. 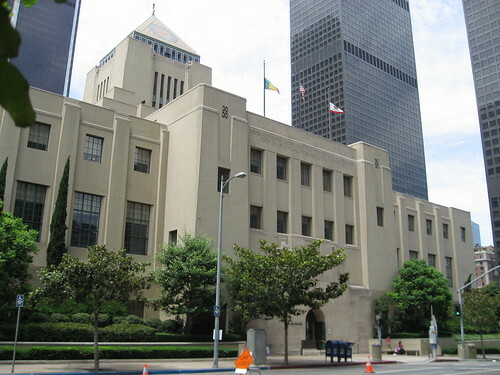 The battle to preserve the library was the impetus behind the 1978 formation of the Los Angeles Conservancy. 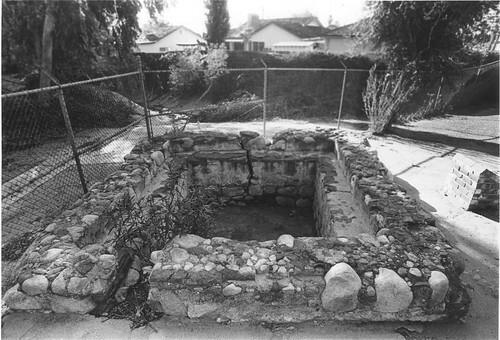 In 1983, the city decided to save and restore the building. 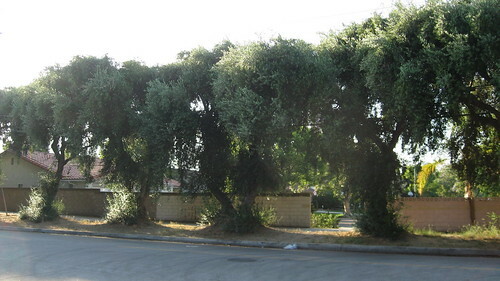 The Grand Avenue side. This is the new section named after Tom Bradley. "Wisdom is the ripest fruit of much reflection", except with v's for u's. Before the restoration could begin in earnest, though, the library shut down when a huge arson fire occurred on April 29, 1986, destroying more than 400,000 books. Arsonists struck again that September. 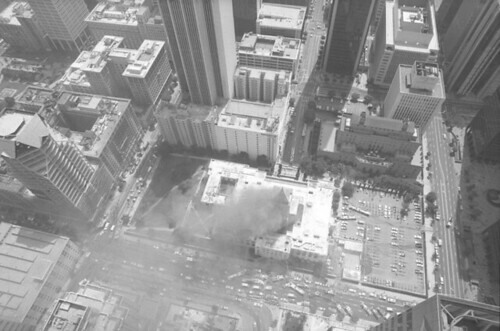 The April 29, 1986, fire. 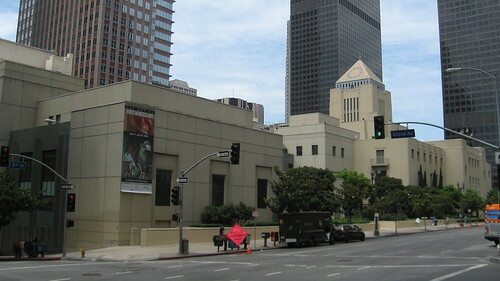 Restoration began in 1988 with money that in large part was received when the library sold its air rights, allowing skyscrapers to be built next door. 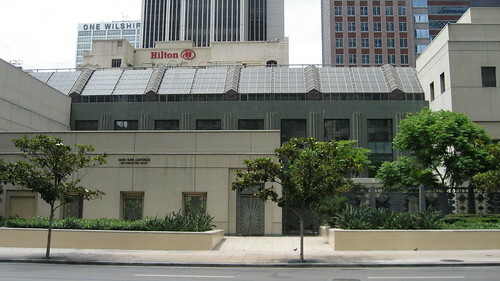 During that restoration, the open space on the east side of the building was lost when a new eight-story wing named for Mayor Tom Bradley (1973 – 1993) was constructed (the new wing was designed by Hardy, Holzman, and Pfeiffer Associates). The library re-opened in October, 1993. 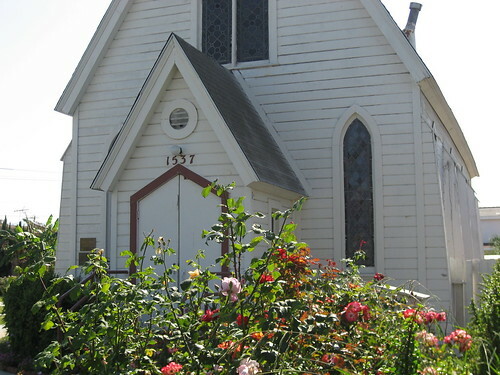 The Flower Street side. A couple of new trees were being planted this Saturday. 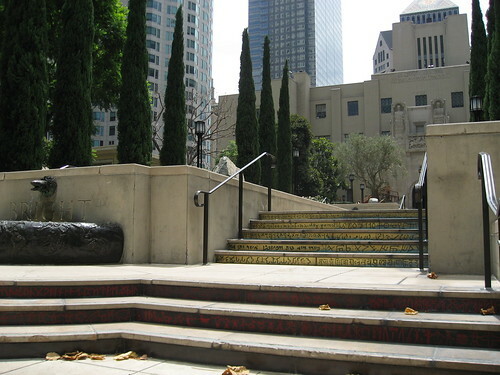 "Risers on the steps on either side of the fountains encompass slightly patinated brass with letters from 19 languages etched in green; black copper plate with printed words in nine languages cut into the surface in white; and symbolic communications in higher math, art and poetry established during the electron age, etched on stainless steel plate in black." 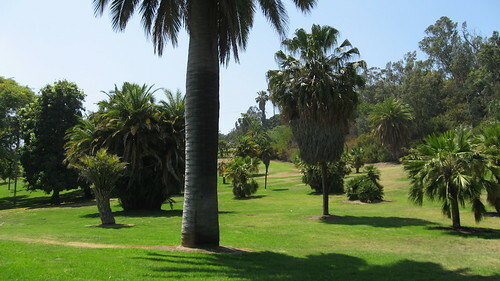 The Gardens include pools, fountains, and sculptures. Now, for the inside. Again, go the library’s official site, specifically this page, for a much more detailed scoop on the artwork contained therein. There are tons of murals, chandeliers (literally tons), reliefs, statues, inscriptions, mosaics, and whatnot. 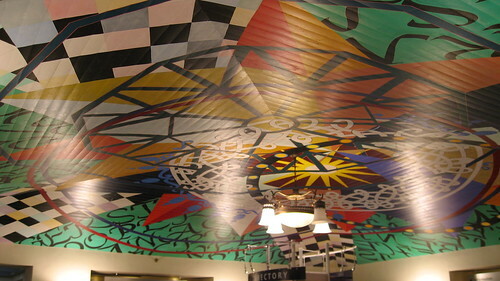 The first thing you see when you hit the main lobby is this painted ceiling by Renee Petropoulos. See if you can read the names of L.A. authors mixed in. 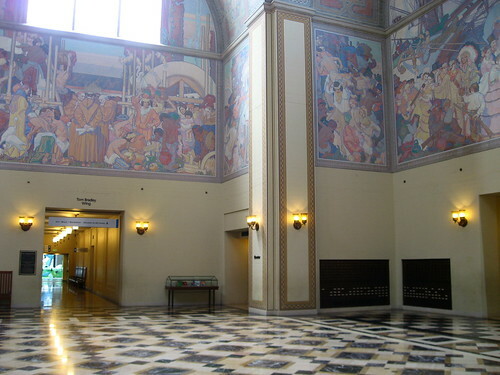 There are more than 9,000 square feet of murals in the Lodwrick M. Cook Rotunda, named for the ARCO man who led the fund-raising efforts after ’86 fires. 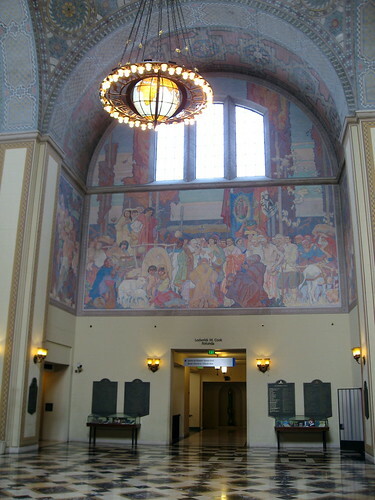 The murals depict four eras of California history: Discovery; Mission Building; the Beginnings of Art and Industry; and Conquering the Elements. Dean Cornwell painted them, finishing in 1932. 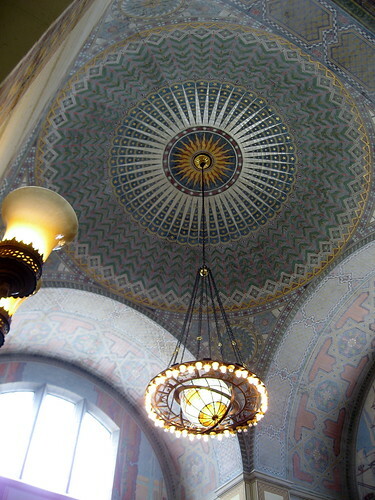 The dome’s decorations are by Julian E. Garnsey. 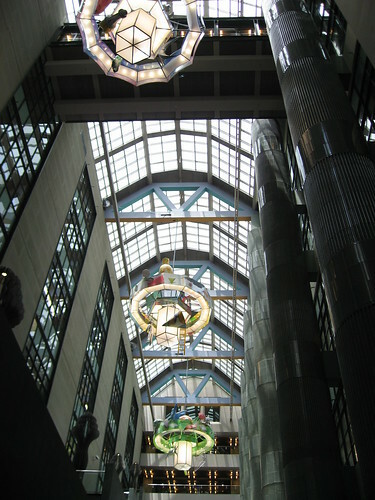 The solar-system chandelier was modeled by Lee Lawrie. The 48 lights represent the then number of states (sorry, AK and HI). I don’t know which states are represented by those eight burnt-out bulbs, but I’m sure I got speeding tickets in at least three of them, so good riddance. Let’s give a big hand to this big hand. You can’t tell by the cruddy picture below, but this Light of Learning Torch is really about seven feet tall. For about sixty years it stood atop the library’s crowning pyramid. During restoration in the late 1980s, it was proven too fragile and was replace by a replica. It, too, was sculpted by Lee Lawrie. Some more Lawrie work. 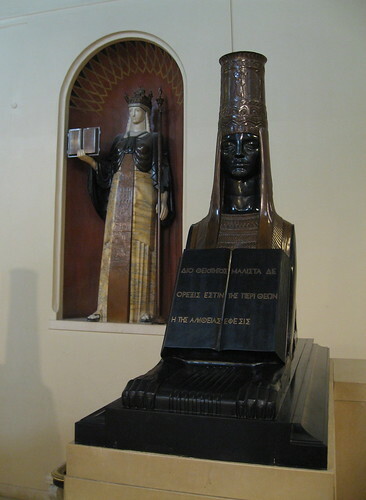 According to the library’s website, the Statue of Civilization "symbolizes all the Library represents.” For lists of what’s written on her book and what the symbols on the panels stand for, click here. To her left (your right) is one of a pair of Belgian marble sphinxes acting as guards. "Therefore the desire of Truth, especially of that which concerns the gods, is itself a yearning after Divinity." 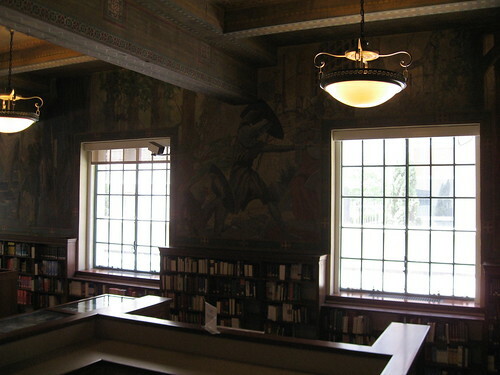 When you enter the Children’s Literature Department (formerly the History Department), you’ll see a series of California history murals by Albert Herter. 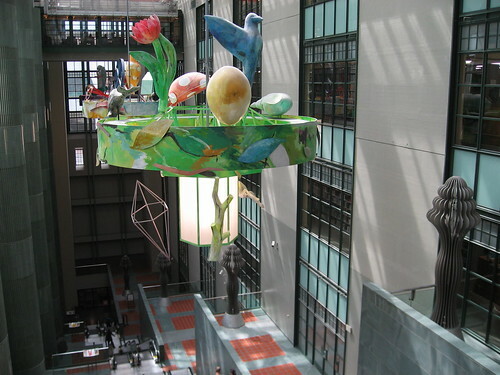 Therman Statom created these three chandeliers in the Bradley Wing atrium. 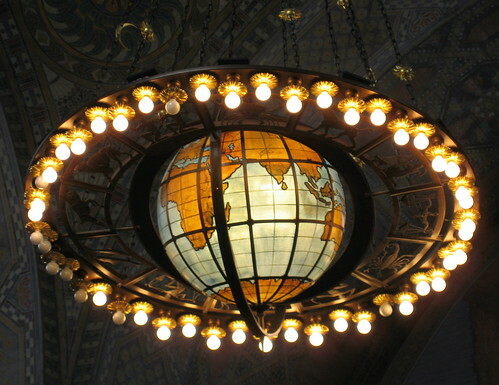 They represent the natural, the man-made, and the spiritual worlds. 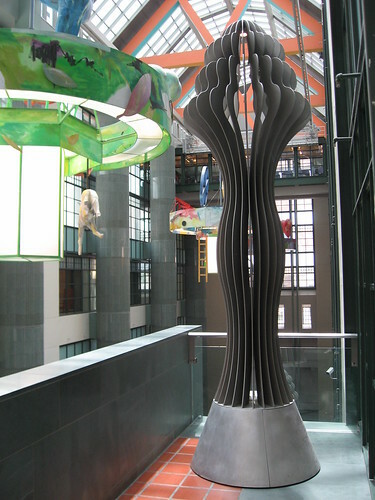 This is one of the atrium’s lanterns, called Illumination, by Anne Preston. 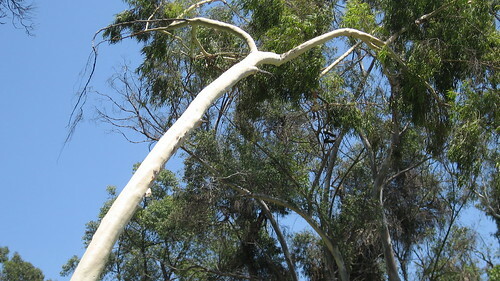 The top part is supposed to be an upside-down human profile. Flip over your computer and let me know what you think. One last thing. I didn’t include a shot of the interiors of the library’s elevators whosewalls are made up of old card catalog cards. The pictures are real blurry. But if you go to the library, see them (the elevators, not my blurry pictures). 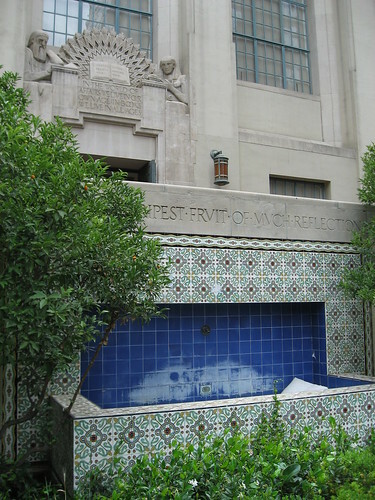 There's a lot more information and pictures of the landmark's artwork at Public Art in L.A. You should read it before your next trip to the library. You can also print out a self-guided tour here. There are volunteer docents to give free tours, too, although the guide was a no-show when I was there. 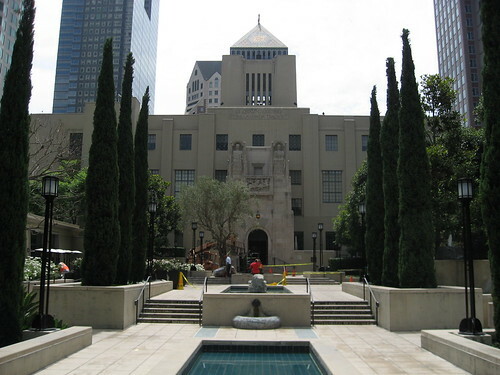 The Central Library Building is also listed on the National Register of Historic Places.